Eek! I’m late in posting the party tonight because I got caught up in creating this button collage for my sidebar. I love to design things and time just seems to slip away when I’m having fun. If you’re joining us at Haven, can you believe it is one short month away? So exciting! I can’t wait to hug you all! Okay some quick announcements before we begin. Make sure you jump over and ogle all of the amazing features from last week! There are a ton of fantastic outdoor ideas to inspire you. Also, I have a 3M Projector review and $150 Target gift card up for grabs! Thanks for hosting such an amazing party! I love seeing what everyone links up. This is my first time linking to one of your parties. Thanks so much for hosting and I’m your newest follower by email. Thanks for hosting Beth! Can’t wait to hug you too! Thanks for hosting, Beth! I’m so excited for Haven and looking forward to meeting you. I recently started following Home Stories A – Z on facebook. First time today at your linky party! Thanks for hosting. I know EXACTLY what you mean about time and graphic design. I’ve lost whole days to working on a coaster design and forgotten to eat or anything. Your button looks great! Haven sounds like it’s going to be an excellent gathering. Thanks for hosting again! Hope you’re having a great week! I found your blog over Tanya, Thanks for link up. Love your project gallery. Thank you so much for another great party! Good luck at Haven… wish I could go!!! Looking forward to meeting you at Haven…..can’t believe it’s only a month away! Woohoo! 🙂 See you there…..
I’m really sorry to miss Haven. Unfortunately, it’s scheduled for when we already had a family vacation planned. I know everyone attending is going to have a great time. Beth, thanks for the Linky Party! I’ve linked up a Seashell craft. 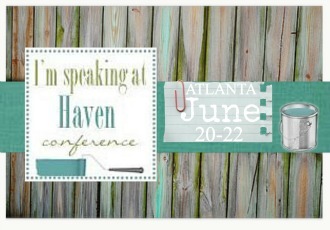 Can’t wait to meet you at Haven! Thanks for hosting. If I was going to Haven I would be spending time on a button too.. it is going to be such a great time! Yay!! Can’t wait til Haven!! So excited! Thanks for hosting!! Honestly, I’m so impressed that you can design your own graphics. You’re so much more intrepid than I–I really am a scardey-cat when it comes to things like this. And, honestly, I’m not particularly good at “figuring things out” when it comes to work with the computer. Not really a good way to be if you’re a blogger, now is it? I know y’all are going to have a wonderful time at Haven. It’s the one conference I’m going to be really, really sorry to miss–not so much of the content of the conference, even though it sounds wonderful, but because of the blessed and wonderful people who are involved. I hope you have fun and, quite frankly, I hope that each of you involved in the organization of this conference is overwhelmingly successful in some way–either in monetary terms, or increased influence, or marketability, or whatever. Of all the bloggers I know, I think this group represents some of the most deserving of success. Thanks for hosting this cool party each week! I’ve learned that hosting a weekly link party is a lot of work, and I appreciate it. You are such a gem Richella! Your gift of encouragement always blesses me :). Thanks girl. Thanks for hosting Beth! Wish I were going to be there! I’ll definitely be excited for all the scoop following!!! Nope. No freak out about the presenting yet. I LOVE to present! I’ll save the freaking out for the day before the conference and then I’ll start hyperventilating a tad. Thank you for hosting the party Beth! Cute Haven button. ONE MORE MONTH!!! Whoo hoo, I’m so excited!!! Aw, bummer! Next year for sure! Ha! You should have tweeted me out of my focused coma and reminded me to post! Thank YOU for linking up :).